A mortally wounded Martin Luther King Jr surrounded by friends and aides. Marrell Mccullough appears to be holding him in his arms. By all accounts King was in a jovial mood that April 4 day. While standing on the balcony he joked with friends and colleagues while he waited for his jacket. At 6:01 a shot rang out, hitting King in the side of the face. Friends rushed to his side and desperately tried to stop the bleeding. Police soon appeared on the scene guns drawn asking where the shot came from. Those on the balcony pointed in the direction of an old run down hotel across the street. 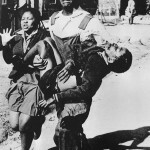 That moment was captured by photographer, James Louw, and now lives in infamy as King’s death shot. Dr. Martin Luther King, Jr. (January 15, 1929 – April 4, 1968) was the most famous leader of the American civil rights movement, a political activist, and a Southern Baptist minister. In 1964, King became the youngest man to be awarded the Nobel Peace Prize (for his work as a peacemaker, promoting nonviolence and equal treatment for different races). In 1977, he was posthumously awarded the Presidential Medal of Freedom by Jimmy Carter. In 1986, Martin Luther King Day was established as a United States holiday, only the fourth Federal holiday to honor an individual (the other three being in honor of Jesus of Nazareth, George Washington, and Christopher Columbus). In 2004, King was posthumously awarded the Congressional Gold Medal. Considered by many as one of the greatest public speakers in U.S. history, Dr. King often called for personal responsibility in fostering world peace. King’s most influential and well-known public address is the “I Have A Dream” speech, delivered on the steps of the Lincoln Memorial in Washington, D.C. In late March, 1968, Dr. King went to Memphis, Tennessee in support of the black garbage workers of AFSCME Local 1733, who had been on strike since March 12 for higher wages and better treatment: for example, African American workers, paid $1.70 per hour, were not paid when sent home because of inclement weather (unlike white workers). The night before on April 3, Dr. King returned to Memphis and addressed a rally at the Bishop Charles Mason Temple, delivering his famous I’ve been to the Mountaintop address. After the assassination the city quickly, quietly, and on favorable terms settled the strike. This is Ralph, this is Ralph, don't be afraid. The owner of the Lorraine Motel, Walter Bailey, where King was staying claimed that King was a frequent guest at the establishment and that Reverend Ralph Abernathy, told the United States House Select Committee on Assassinations (HSCA) under oath that he and Dr. King stayed in room 306 at the Lorraine so often that it was referred to as the “King-Abernathy suite.” Bailey also remembers that on that fateful day, April 4, 1968, King was especially happy and while he was getting ready was, “teasing and cutting up” those present. One of King’s best friends and number two man in the SCLC, Reverend Abernathy, remembers that around 1 that day he and King had fried catfish for lunch and then Abernathy had a nap waking around 4 p.m. to King on the phone asking him to come over to his Brother’s, who was travelling with them, room. When Abernathy arrived King told him that dinner was set for 6 p.m. as they had been invited for prime rib roast and soul food such as chitterlings, greens, pig’s feet and blackeyed peas at the local Rev. From right to left Hosea Williams, Jesse Jackson, Martin Luther King Jr., Rev. Ralph David Abernaty posing for pictures on April 3, 1968. 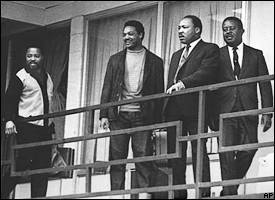 They are on the same Lorraine Motel balcony that Dr. King would be killed on the next day. While the two got ready back in their room 306 Rev Kyles appeared and told them to get a move on or they would be late for the dinner. Dr. King had to assure Kyles that he had telephoned the preacher’s home and that Mrs. Kyles had said dinner was not until 6. “We are not going to mess up her program,” said Dr. King. King and Kyles went to the balcony that overlooked the motel parking lot and swimming pool. There was a crowd of people present getting ready to go for dinner. King greeted the people below and from the second floor Rev Kyles had a short conversation with the SCLC attorney Chauncey Eskridge who had been in Federal court most of the day trying to solve some legal problems with the strike protest. Other SCLC members were in the courtyard including advance team members Rev. James Orange and James Bevel. They had been sent ahead of time to deal with a black militant group called, The Invaders. The Invaders were pushing for violence something King deplored. In fact Orange had just arrived with Invader member, Marrell McCullough, who was in fact an undercover agent working as a mole in the Invader group. King’s chauffeur, Solomon Jones, who had been beside King’s limo all day looked up and noticed that King didn’t have a jacket and called up that King should put on a jacket as it was getting cold. Witnesses recall that Dr. King smiled back at his driver and said, “Solomon, you really know how to take good care of me.” They were about to go when Abernathy decided to slip back into the hotel for some aftershave while King waited on the balcony chatting to members of his entourage below. 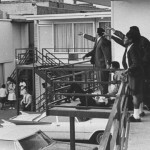 At 6:01 p.m., as Dr. King stood behind the iron balcony railing in front of room 306, the report of a high-powered rifle cracked the air. A slug tore into the right side of his face, violently throwing him backward. At the mirror in room 306, Abernathy poured some cologne into his hands. As he lifted the lotion to his face, he heard what sounded like a “firecracker.” He jumped, looked out the door to the balcony and saw that Dr. King had fallen backward. Only his feet were visible, one foot protruding through the ironwork of the balcony railing. According to Abernathy, the bullet was so powerful it twisted Dr. King’s body so that he fell diagonally backward. As Abernathy rushed out to aid his dying friend, he heard the cries and groans of people in the courtyard below. 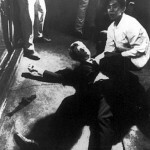 Just below the balcony, Jones recalled that Young and Bevel shoved him to the ground just after the firecracker sound. He looked up and saw Abernathy come out of the room and then realized that the prone Dr. King had been shot. Lee, who had been talking with Young and Bevel, took cover behind a car and then noticed Dr. King’s feet protruding through the balcony railing. Memphis undercover policeman McCullough recalled that immediately before he heard the shot, he saw Dr. King alone on the balcony outside room 306, facing a row of dilapidated buildings on Mulberry Street. As he turned away from Dr. King and began to walk toward his car, McCullough, an Army veteran, heard an explosive sound, which he assumed was a gunshot. He looked back and saw Dr. King grasp his throat and fall backward. According to McCullough’s account, he bolted up the balcony steps as others in the courtyard hit the ground. When he got to Dr. King’s prone figure, the massive face wound was bleeding profusely and a sulphurous odor like gunpowder, perhaps Dr. King’s depilatory, permeated the air. McCullough took a towel from a housekeeping tray and tried to stem the flow of blood. Eskridge had heard a “zing” and looked up toward the balcony. He saw that Dr. King was down, and as Abernathy walked out onto the balcony, Eskridge heard him cry out “Oh my God, Martin’s been shot.” A woman screamed. Abernathy recalled that when he walked out on the balcony, he had to step over his mortally wounded friend. “Don’t say that, don’t say that,” Abernathy responded. Kyles ran back to room 306 to call an ambulance but the switchboard operator, the motel owner’s wife, wasn’t at her desk. Kyles would later find out that she had gone out to the parking lot so that she could see Dr. King. When she saw what happened, she collapsed with a heart attack and would later pass away as a result. Having no luck with the motel phones Kyles ran onto the balcony and noticing police in the courtyard screamed for them to call an ambulance on their radios. While waiting for it to come he took a spread from one of the motel beds and covered him from his neck down. He also took a crushed cigarette from his hand. Dr. King never smoked in public as he didn’t want the kids to see him smoking. Rev Abernathy kneeling over his friend tried desperately to stop the bleeding. Around 5 mins after King had been shot an ambulance arrived and took away him away to St. Joseph’s Hospital where he was pronounced dead at 7:05 p.m.
Jesse Jackson also still in shock had by this time made his way to the balcony from where he was hiding down by the pool. Andrew Young remembers seeing Jackson dip his hands in the huge pool of blood and after raising them to the sky wiped them on his shirt, “people freaked out and did strange things … it was_ it was_ I mean, what do you do in a moment like that”? The black people’s leader, our Moses, the once in a 400 or 500-year leader has been taken from us by hatred and bitterness. Even as I stand at this hour, I_ I cannot even allow hate to enter my heart at this time, for it was sickness, not meanness, that killed him. While the rest of SCLC was back at the motel trying to figure out the next step, Jesse Jackson quickly made his way back to Chicago where hours after King’s death he appeared on the Today show with his bloody shirt while a newly hired booking agent got him spots on other TV shows. Overnight Jesse Jackson became a nationally known figure of the civil rights movement. 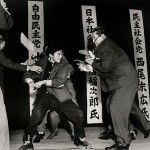 The assassination led to a nationwide wave of riots in more than 60 cities. Five days later, President Lyndon B. Johnson declared a national day of mourning for the lost civil rights leader. A crowd of 300,000 attended his funeral that same day. Vice-President Hubert Humphrey attended on behalf of Lyndon B. Johnson, who was meeting with several advisers and cabinet officers on the Vietnam War in Camp David. Two months after King’s death, escaped convict James Earl Ray was captured at London Heathrow Airport while trying to leave the United Kingdom on a false Canadian passport in the name of Ramon George Sneyd. Ray was quickly extradited to Tennessee and charged with King’s murder, confessing to the assassination on March 10, 1969 (though he recanted this confession three days later). Later, Ray would be sentenced to a 99-year prison term. On the advice of his attorney Percy Foreman, Ray took a guilty plea to avoid a trial conviction and thus the possibility of receiving the death penalty. 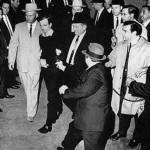 Ray fired Foreman as his attorney (from then on derisively calling him “Percy Fourflusher”) claiming that a man he met in Montreal, Canada with the alias “Raoul” was involved, as was his brother Johnny, but not himself, further asserting that although he didn’t “personally shoot Dr. King,” hinting at a conspiracy he may have been “partially responsible without knowing it”. He spent the remainder of his life attempting (unsuccessfully) to withdraw his guilty plea and secure the trial he never had. There was much attention devoted to the identity of Raoul and involvement of Ray’s brother, Jerry Ray. One book by William Bradford Huie, They Slew The Dreamer, labels Raoul as George Ben Edmondson. Edmondson was a convict who learned computer programming in a Jefferson City prison and escaped eventually making his way to Canada where he worked for the West German Pavilion at Expo ’67 in Montreal. Nothing else was made of the connection and Edmondson was released and returned to Canada but the media attention by the time of his release had died out and nothing was followed up. Edmondson himself saw the allegation as ridiculous. Another theory offered by a 1977 New Times magazine article suggested that Jerry Ray (James’ brother) and “Raoul” were one and the same. State prosecutors in Memphis claimed to have investigated Raoul and did find the individual but insisted that he had nothing to do with the killing and was working on the day he was shot. 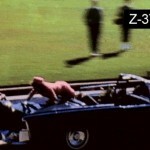 U.S. House Select Committee on Assassinations investigated the Kennedy and King assassinations released a report in 1978 that Ray was the killer but that he didn’t act alone. They concluded that a group of white supremacists in St. Louis, reportedly with a $50,000 bounty on King’s head, might have been involved, too. The house committee’s full report are sealed until the year 2029. On June 10, 1977, shortly after Ray had testified to the House Select Committee on Assassinations that he did not shoot King, he and six other convicts escaped from Brushy Mountain State Penitentiary in Petros, Tennessee. 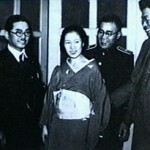 They were recaptured on June 13 and returned to prison. More years were then added to his sentence for attempting to escape from the penitentiary. Ray died in prison on April 23, 1998, at the age of 70 from complications related to kidney disease, caused by hepatitis C probably contracted as a result of a blood transfusion given after a stabbing while at Brushy Mountain State Penitentiary. It was also confirmed in the autopsy that he died of liver failure. So who really killed Dr. Martin Luther King Jr. or was there no further investigation? Did they ever find this Rauol guy and his brother johnny? 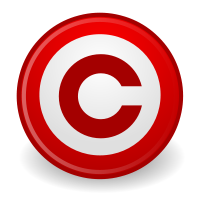 Also, in a civil suit brought by the family of the Rev. Dr. Martin Luther King Jr a ruling was reached on December 9, 1999. The jury decided that a Mr. Jowers a owner of Jim’s Grill in 1968 was responsible. Not just Jowers was found responsible, him and several government departments. It’s actually been admitted in a court of law that your own government killed Dr King. This courtcase was not I believe, highly covered in the news which is why people need to re-research this whole story and then be real, real mad that you’ve been lied to. I’ll say this again so you know I was’nt joking the first time. During a civil courtcase in 2002, the King family won a case whereby Jowers and “certain” governmental agencies were responsible for the death of Dr King. I cant believe people dont know about this, and I cant believe you aint steaming mad about it. If that had of been Ghandi, the whole of India would have come to a standstill, the entire country would have gone on strike in protest…….but what d’yall do? Y’all ask stupid questions like “who really killed Dr King” when its already been proven in a court of law. And no, I’m not talking about Earl Ray, I’m talking about Jowers and the help he got from the FBI and CIA. Tell you what, when America can tear itself away from its video games and decides to wake up, the revolution will be over…….thisaway. We may never know what really happened in Memphis. So many things happen beyond the scope of our knowledge. Most of the unique so called black leaders get scandalized and get out of the way or they are accused of some horrific crime and get put away. Even the tupac murder, the Jackson murder, the Panthers who have been killed. Teddy sang wake up! We really need to do just that. Ben Branch was a musician (saxophonist) and conductor, not a singer.